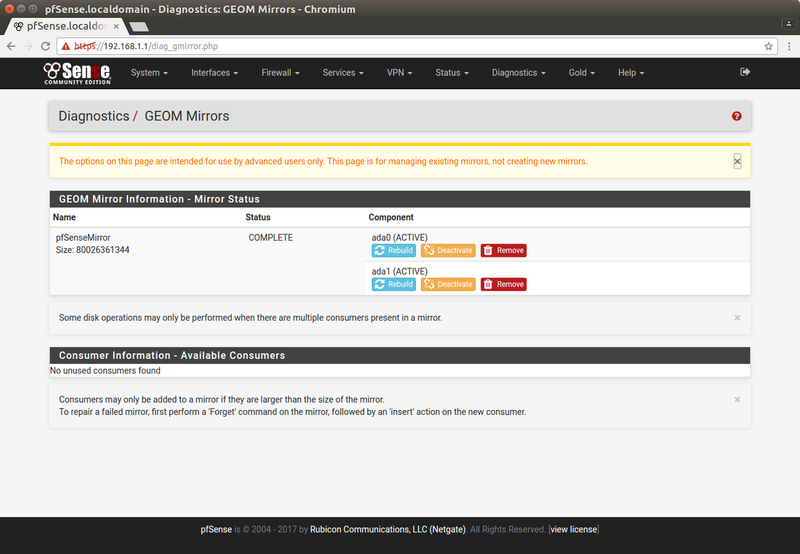 I'm now looking for a way to monitor the status of the gmirror, and I have searched in the web interface for such an option (but I did not find a site or widget for that). I only found this https://github.com/mibuthu/opnsense-core/blob/master/src/sbin/gmirror_status_check.php on a GitHub fork. Are there currently any options to monitor the status of a gmirror? If not: are there any options planned for this? If there are no options planned currently: should I open a github issue here: https://github.com/opnsense/core/issues ? Thank you for the hint how to monitor the SMART status of the disks. I've installed the plugin and added the widget. Any other ideas if there is a way to monitor the gmirror state? you can do that with the new os-monit plugin and a little script. The plugin is available since 17.1.5. It's a monitoring software that can execute scripts and generate alarms according to the return value. Create a script e.g. /usr/local/bin/check_gmirror.sh and make it executable. You can see the output of the script at the Monit status page. A bit late to the party. GEOM raid GUI parts were stripped a long time ago, maybe there is opportunity to bring something back, though users of this feature seem few (or silent). At one point we also wanted to strip it from the installer, but somebody intervened, so it's still there, functioning ok it seems. Just plugging old pages back may not be worth it in the long run. Monit may indeed be the way to go... we are looking for a generic notification / reporting replacement and maybe it's just that and it will be added to the core functionality in the long run. It's difficult to say yet without having started the replacement process.